Molluscum Contagiosum is a rare disease that practically no one has ever heard of – until they or someone in their family gets it. And if you’re one of those unlucky few, then you know what a nightmare it can be! Especially since according to the Doctors, your choices are “wait it out” or painful, expensive, and non-guaranteed scrapping procedures! OUCH! Well, True Love to the rescue once again! 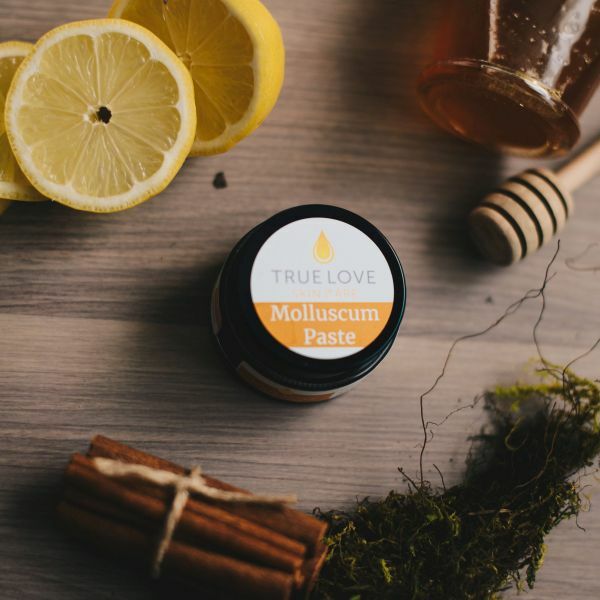 Molluscum Contagiosum is closely related to HPV (which causes warts) and so we took our amazing Wart Paste as a start and came up with Molluscum Paste. This paste is specially formulated to soothe the itch and burn, but more importantly, deliver vital vitamins, minerals, and other nutrients exactly where it’s needed to fortify your skins natural defenses. Most users see positive results in a few weeks instead of months when left untreated. Apply each night before bed & remove in morning. Repeat until all signs of infection are gone. Molluscum Paste is perfectly harmless to healthy skin. No need to avoid healthy skin. Open jar carefully (to avoid spillage). Apply a small (pea-sized) drop over infected area and gently spread paste. Repeat as needed to cover entire infection. Cover Paste with light gauze. Be sure to not use medical tape on infected area. Remove in morning, and repeat each night until infect completely gone.